In the first part I tested the conversion of bitmaps to the SVG format using the programmes KVEC 2.75, fds for SVGs, CR2V and Illustrator 10. This page is now about Vector Eye. On my first test report page the free CR2V has shown very good results. 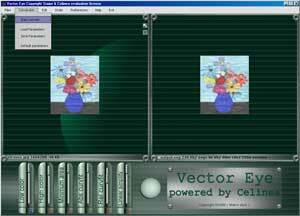 Since January 2003 there is now Vector Eye, the follow-up tool which is not free anymore, but offers some serious advantages. 2004: Note, there is a new version and new pricing (see below)! One of the disadvantages of CR2V was the fact that you had to enter the parameters for conversion into the command line. The whole proceeding was somewhat awkward and it even did not let some of my readers succeed. Vector Eye on the other hand now comes with a graphical user interface, which is very easy to use. On the left the original image, on the right the converted SVG version. On the bottom you can see the operating elements for the setting of the various parameters for conversion. These formats can be converted with Vector Eye: BMP, JPG, PNG, TIFF. With CR2V the GIF format was amongst these, too. There is no big difference to be seen between the CR2V and the Vector Eye version. Again, in this case I have used the default parameters. You can, however, make various changes to the parameters for conversion in both programmes in order to achieve a result which is closer to the original. This would, on the other hand, result in much higher filesizes. This is why I have created a much less complex original for the following example. For the next test I created a less complex image. In this example I wanted to achieve an exact conversion of the line drawing. Here I have now changed the values for "Relative Curve" from 30 to 0 and for "High Color" from 180 to 35, in order to achieve a much bigger similarity to the original file. Can you make out a difference? I can't. The converted SVG files can now be further edited in all vector graphics tools, which support the SVG format. You can e.g. change single paths or replace single colours. In the image "Dinner" I have replaced the bright grey (#e2e2e2) of the bowl by orange (#f96446). With CR2V, too, there was the possibility to change all those many parameters according to your wishes, however, playing around with those various options was quite awkward in CR2V, since you, first, had to work in the command line and, second, had to create a new SVG file each time and to open it in your browser, in order to see, whether the applied change has lead to the preferred result. With Vector Eye, though, you only play around with those controllers and immediately see the result in the right window (the Adobe SVG Viewer 3 is embedded as ActiveX component into the software). Only in case you like the result you save it as SVG file. Both programmes have a manual for the use of the various parameters for conversion, but the one from Vector Eye is much more comprehensive and provided with many graphic examples. Another advantage: Vector Eye produces much smaller filesizes than CR2V. Btw: Take a look at those beautiful examples in the gallery of the Vector Eye site. Tiny little drop of bitterness for people who have a 15-inch-screen: The use of Vector Eye requires a screen resolution of at least 1025x768. How sad that this software (up to now) only operates on a Windows platform. There are even more new features. As soon as I will have the time, I report about them.